If you've noticed I've been blogging less, I promise I'm not going anywhere! There's been lots of excitement around here lately. I'm spending a lot of time planning for the future (a sneak peek at what's next for me here)- wedding, house, business.. the whole shenanigans! I've been feeling more inspired than ever thanks to some serious goal setting with my PowerSheets (see what I'm saying "yes" to this Spring here). I've also tried to be really intentional with the way I spend my time. So even during the most exhausting weeks I've been making time for skype dates with my girls, a mid-week trip to the book store with my guy, and weekends without a cellphone attached to my hands. 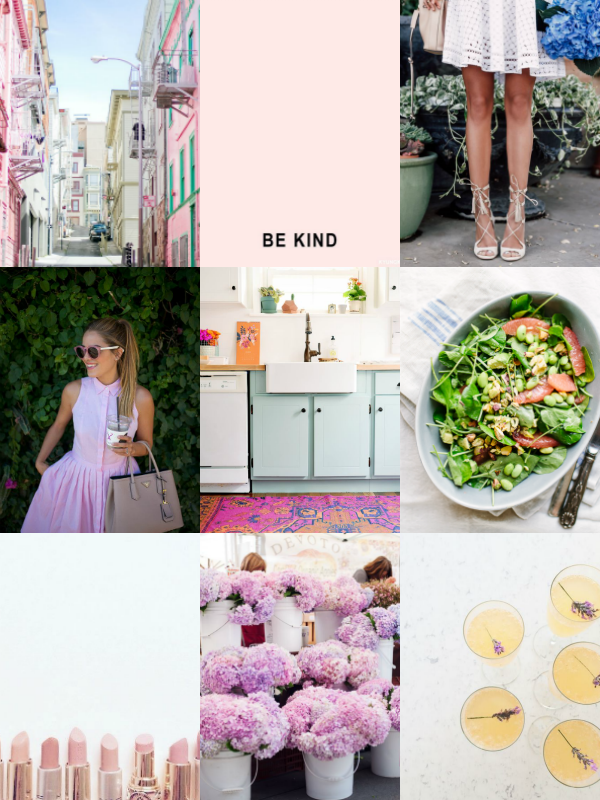 I thought I'd share a peek at what's inspiring me most this month! 1. San Fran: Headed there for a girl's trip with my mama to visit my sister next month. SO excited! 2. Be Kind: This is kind of my life long mantra. As my gramma always told me, "you catch more flies with honey than vinegar". 3. Lace-Up Heels: I can't think of a prettier pairing with all of spring's lacy pastel hued dresses. 4. Preppy Pink Shirtdress: So in love with this bubble gum pink frock- it has a vintage feel, right out of the 1950's. 5. Colorful Rugs: We're planning on a pretty neutral rustic décor for our fixer upper, so I love the idea of a pop of color with a bright rug. 6. Avocado, Edamame & Grapefruit Salad: This combo sounds so fresh & springy. Totally going to make it for lunch this week! 7. Neutral Lips: For spring & summer I'm digging these neutral lips with peachy bronze cheeks & a dab of mascara. 8. ALL THE FLOWERS: Am I the only one who can't help but pick up a bouquet every time I wander into Trader Joes? This time of year just makes me want to fill every room with a vase of fresh florals. 9. St. Germain & Grapefruit Mimosas: Seriously all of my favorite ingredients rolled into one and those lavender sprigs? SO cute. Hello weekend brunch! So, what's inspiring you this month? Are you feeling the April blues or fired up for a new season?